Unclassifiable and Probe QC failed samples are not shown in this plot. Boxes show the confidence interval for subgroup assignment generated by bootstrapping, and the individual data points represent the final probability associated with each subgroup call. MIMIC will classify MassARRAY medulloblastoma methylation data in to one of four molecular subgroups: WNT, SHH, Group 3 and Group 4. We use 17 different methylation probes in an Agena iPLEX assay , the readout is performed by the MassARRAY mass spectrometer. Peak heights from the Mass Spectrometer, corresponding to the 17 probes for each sample are outputted as a comma separated .csv file; these values are submitted to MIMIC and converted to β values for each probe. The number of probes successfully reporting β values out of the 17 is assessed for each sample, imputation (exploiting our own MassARRAY cohort) is used to impute any missing values using multiple imputation (MI) modelling utilising a Bootstrap Expectation Maximisation (BEM) algorithm implemented in the Amelia package. We can efficiently impute missing values of up to 6 missing probes, if a sample has more missing values it is said to have failed Probe QC and is not classified. A multi-class optimised Support Vector Machine (SVM) validated and trained on our extensive 450k medulloblastoma cohort is used to robustly assign a subgroup to samples by their 17 β values. Our SVM is validated using a bootstrapping technique via 1,000 random iterations of 80% of the training set, confidence interval derived from this is plotted on the Classification Graph as a box plot. The final probability assignment for a subgroup call is made by creating an SVM model with the whole 450k training set; these probabilities are given in the Classification Table in the initial tab. Calls made with a probability below our predefined threshold are considered unreliable and samples will be labeled as Unclassifiable in the Classification Table, these samples will not be plotted in the Classification Graph. Various post processing and formatting operations on the data take place with the interactive website being implemented in the R Shiny reactive web application framework. For a typical dataset with 14 samples this whole computational procedure will take around 4 seconds - total classification time is given below the Classification Graph. For more detailed explanation of our classifier including various optimisation and validation exercise see our manuscript and corresponding supplementary information (manuscript in preparation). A manuscript is in preparation. The R code for this Shiny based website including training and validation cohorts can be downloaded from GitHub the website can also be run locally using Rstudio instructions and dependancies are outlined on GitHub. MIMIC development was funded by a Cancer Research UK program grant. A Comma separated value (.csv) file produced by the MassARRAY scanner is needed as input to use the classifier. If you would like to test drive the classifier, or would like to see how it should be formatted a test file can be downloaded using the link in the grey box on the left. 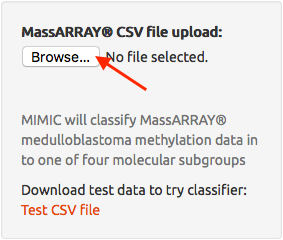 A MassARRAY .csv file can then be uploaded by clicking on the 'Chose File' or 'Browse...' (browser dependent) button on the left, once uploaded the classification happens automatically. 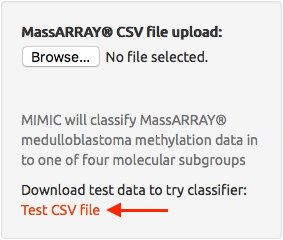 By default the Classification Table output is preselected and will present you with a four subgroup Medulloblastoma classification for each of your samples. Other tabs presenting other information can then be accessed by clicking their names present at the top of the main panel. The contents of Tables can be downloaded by clicking the grey download button, these .csv files can then be loaded into Excel or other spreadsheet software if required. The Classification Plot can also be downloaded as a .png by clicking on the grey Download button at the bottom of the Classification Plot tab. Probe names (corresponding to 450k probes) we use are: cg00583535, cg18788664, cg08123444, cg17185060, cg04541368, cg25923609, cg06795768, cg19336198, cg05851505, cg20912770, cg09190051, cg01986767, cg01561259, cg12373208, cg24280645, cg00388871, cg09923107 and a final probe Conv_2 is used to assess bisulphite conversion efficiency. If you have any issues with using MIMIC please contact Reza Rafiee. WARNING: MIMIC is for research use only, and should only be used on samples with a confirmed histopathological diagnosis of medulloblastoma. MassARRAY is a registered trademark of Agena Bioscience.